Wishing you all a most beautiful and joyful Christmas! See you in the New Year!! It's pony making day! I've finished shaping them and now I'm adding all the little "coral" pieces. This is my favorite part of making these beads. Here it is!! My giveaway for the First Annual Craft Show! 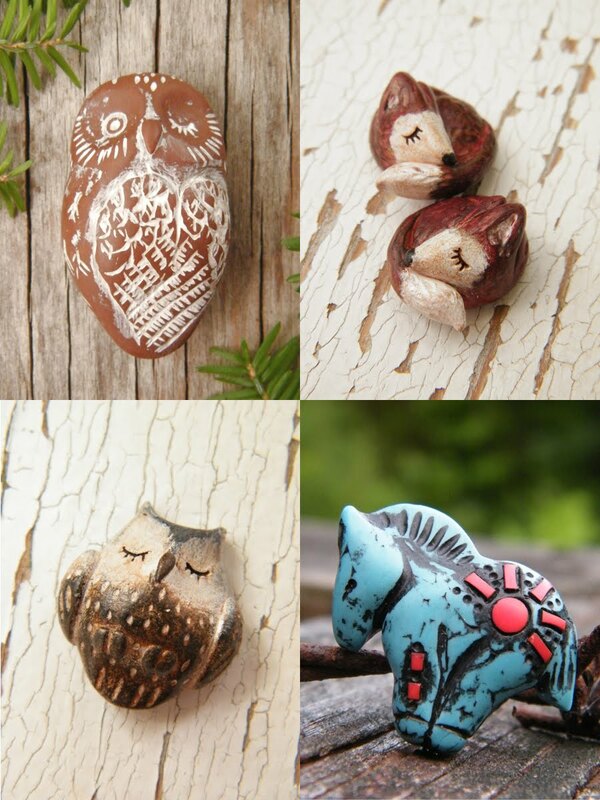 Five of my favorite beads are up for grabs! So how do you enter to win? First, you must go to Lori's blog, Pretty Things... and then just leave a comment. In addition to the giveaway, I've got a sale going on in my shop starting today and running through December 3rd. Use coupon code CRAFTSHOW10 for a 10% discount on everything listed. I couldn't resist. My little fawn beads were just screaming to be Rudolph for Christmas and so I gave them antlers and bright red noses... too cute! But as Christmas is fast approaching and sadly reindeer will be out of style all too soon, I only made 12 of theses guys. Get them while you can! Red fox matched pairs. A right and a left -- perfect for earring making! And calico kitty matched pairs. See them all in my shop! And don't forget to come back tomorrow for details on my giveaway in the Virtual Craft Show! Today marks the start of the week long virtual craft show! 7 Days, 70 Artists, GIVING AWAY 70 things! Fabulous, isn't it??? FanTABulous, actually. Visit our host Lori Anderson over at Prettythingsblog.com for more info. 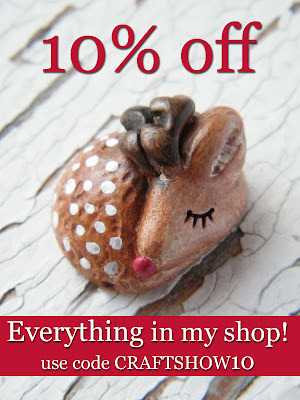 See my giveaway and 10% coupon for my shop there (and on my blog here) on November 27th! Have fun and happy winning/shopping! Black owls. Just like my brown owls in the previous post... only black. This guy is the first to get his photo shoot. His friends Wynken and Nod are next in line. Rustic flower pendants in teal blue. Last Glow at Dusk - polymer rounds, gold "sea glass", crackle agate, blue agate, and Czech glass. Sing Softly - sleepy woodland critter bird, polymer rounds, spotted ceramic beads, blue agate, and gold "sea glass". Come say hello to my new little owlies! They call themselves Blynken, Wynken, and Nod... They're very, very sleepy! New polymer beads for new jewelry. (I'm loving these colors.) You'll be terrified to hear my table is still a horrendous mess - after 3 weeks! And a new order of beads is on its way. Where will they go? Right on top of the mess, of course! Happy messy Bead Table Wednesday!! It's time for Bead Table Wednesday again! I would show you my nice table, but it's not a pretty sight. In fact, it looks very much like my table from a couple Wednesdays ago - a horrid wreck! And believe it or not, I DID clear it off, only to find I can't create with a clean table in front of me. I think there's something wrong with me!! I'm normally a very organized person - files for everything, storage containers of all shapes and sizes - my family says I'm a neat freak! But when it comes to my bead table, I need to have my supplies right there, within reach! So instead of showing you my scary table again, I'll show you a few of my latest designs. Opalite, matte crackle agate, ceramic, pretty Czech roses, seed beads, and my own polymer clay shell beads. I think this necklace is my favorite. One of my polymer rainbow beads, lovely smokey quartz rounds, more rose beads, and a dainty chain made of fancy bead caps and wrapped seed bead links. At the back of the necklace there are more seed beads and fresh water pearls. Hemimorphite, matte crackle agate, polymer clay, and seed beads. Polymer clay shells, real shell coins, opalite, and lots of wire wrapping. Purple Czech roses, antique brass, and my polymer clay stacked beads. And there you have it. Nice things can come from even the messiest of tables!! Five more turquoise ponies! I'm having a blast making these, minus the sanding and polishing. Vigorously scrubbing my fingers with coarse paper is not my favorite thing but, if you work with polymer clay you know that all the effort is really worth it. The fun part is all the tiny inlay work and drawing on the markings. Now, what to do with 5 ponies... For myself I like a pendant on a simple cord or chain most of the time. I think these could also do well with a fancier design. I'll have to think about that one a bit, in the mean time, I'll be listing these in my shop... and making even more... you can never have too many cute little ponies!